Handwritten translations etched permanently on a stainless steel canvas. Some words shall not be forgotten, and neither should the remembrance of the writer. There is not a font in the world that can replicate the unique characteristics of the human touch. This is an opportunity to make your own customized piece of art. Anything you can dream of can be engraved on this dog tag. *SIMPLY ATTACH/UPLOAD A PICTURE OF THE HANDWRITING TO _THE ASK A QUESTION_ LINK NEAR THE TOP RIGHT OF THE LISTING. 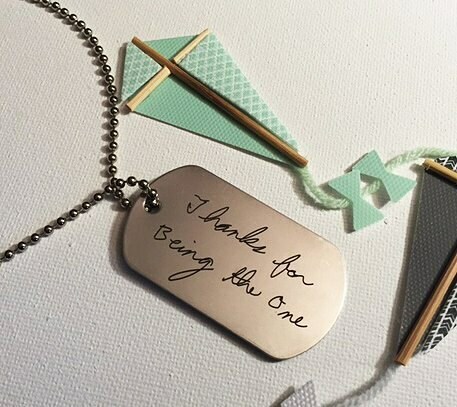 Beautifully, laser engraved with up to 30 characters captured from an image of a handwritten note. Shipped to you, wrapped with care. We use USPS 2 day priority shipping with a tracking number when shipped anywhere in the United States. *High resolution images will produce the best results. If the image is not already cropped, please specify in the customization field what characters you would like etched. Please upload your picture in a message to us.